The class for the Mention Complémentaire has been split in two, which means that we have twice the amount of space to get down to creating and experimenting with fun things. As you can see from this picture, we made floating islands and fruit sabayons. Floating islands are a very popular dessert in France, made of Crème Anglaise and poached meringue. I decided to dip my meringues in toasted coconut flakes as I am practicing for a demonstration at the Salon du Chocolat. The fruit sabayons were finished with a torch for the desired effect. I thought about how I would really like to make Strawberry Sabayon pots, a little bit like Strawberries and Cream, but fancier. What do you think? Here is an experiment I did with the floating islands. I decided to separate the elements on a plate. 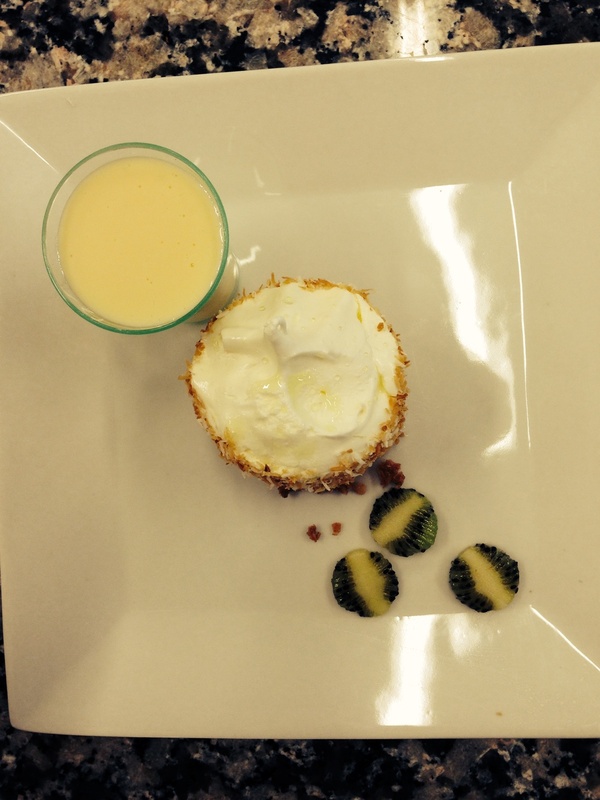 Crème anglaise and french meringue coated in coconut flakes. Here is the dessert with a tuile. Posted on November 2, 2014 by Abigail Scheuer- Sarne and filed under paris and tagged pastry pastrylife inspiration3.